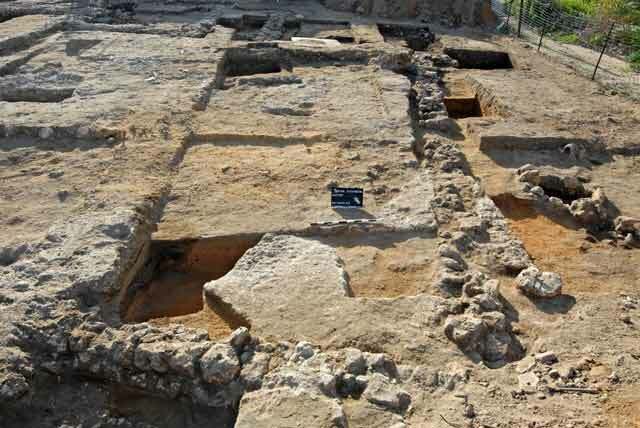 In March 2013, a salvage excavation was conducted in Kefar Gevirol (Permit No. A-6727; map ref. 178670–706/644638–73), prior to construction of residential buildings. The excavation, undertaken on behalf of the Israel Antiquities Authority and financed by the Avisror Company, was directed by E. Jakoel, with the assistance of L. Nadav-Ziv and V. Shustin(area supervision), N. Bashukevich (registration), M. Molokandov (preliminary inspections), Y. Amrani (administration), A. Dagot (GPS), R. Mishayev and M. Kahan (surveying), N. Zak (drafting), A. Peretz (field photography), A. Gorzalczany and Y. Arbel (consultation), Y. Yolowitz (studio photography), B. Ouahnouna (glass), A. de Vincenz (pottery and metal artifacts), R. Kool (numismatics), N. Marom (archaeozoology), A. Glick and A. Peretz (rifle cartridges), R. Vinitsky (metallurgical laboratory) and M. Shuiskaya (pottery drawing). Additional help was rendered by M. Ajami and F. Volynsky of the IAA Central Region. 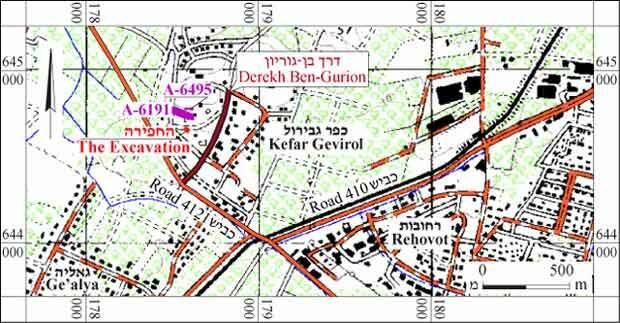 The excavation area, located in Kefar Gevirol, in the western part of Rehovot, was c. 200 m east of Road 4121 (Fig. 1), within the precincts of the Tell Musa Shahin and Kefar Gevirol antiquities sites. Finds dating to the Byzantine, Early Islamic, Medieval, Ottoman and the British Mandate periods were discovered in previous survey (Fischer and Taxel 2006) and excavations (Arbel, Greenvald and Ben-Ari 2013). 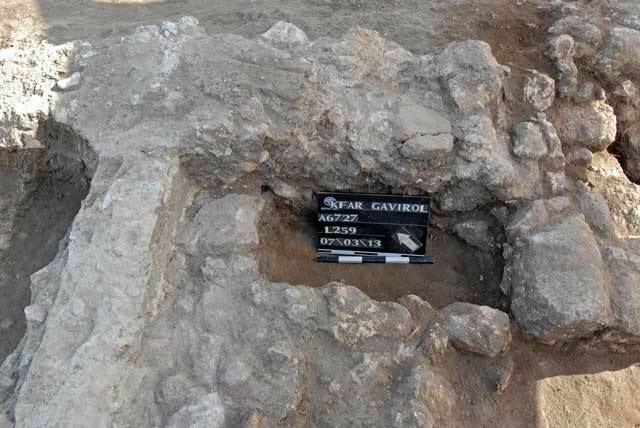 Remains of the Arab village el-Qubibah, which was destroyed in 1948 were found in excavations c. 200 m north of the current excavation area (Arbel, Greenvald and Ben-Ari 2013; Jakoel 2012; Jakoel in print). Twenty-five squares were opened, and architectural remains, cesspits and other pits from the late Ottoman and British Mandate periods were revealed. In addition, a few Byzantine-period pottery sherds were found. The walls that were discovered apparently belong to three buildings (Fig. 2). Building No. 1 was oriented northeast–southwest. Five rooms (Nos. 2, 4–7) survived, around a large central room (No. 1). Long narrow spaces (Nos. 3, 8) between the rooms probably served as passages/corridors and entranceways. Piles of collapsed stones (L239) in the center of Room 8 contained pottery from the late Ottoman period, a perforated coin that was used as jewelry (below) and two rifle cartridges: one German, from the First World War, and the other Israeli from 1969 (see Glick below; Figs. 9:5, 10:2). The foundations of the building were covered with fieldstones and kurkar from the collapsed building, and with modern refuse that accumulated after the area was covered and leveled. Most of the walls were preserved to the height of the foundations, which were built of small and medium kurkar stones bonded with gray soil (Fig. 2: Section 2–2, Fig. 3). The foundations were preserved to a height of two–five courses and were set on sandy earth. Room 1, the largest room (Fig. 4), had a thick, white plaster floor, which was partially preserved (L114). Below the floor was a leveled bedding of small fieldstones. Three rifle cartridges were found in the northern corner of the room: two of them Israeli, dating to 1968 and 1972 (see Glick below; Fig. 10:3A, 3C) and an American one dating to 1975 (see Glick below; Fig. 10:3B). Two more rifle cartridges were recovered in the southern corner of the room: a Israeli one from 1969 (Glick below; Fig. 10:5) and one dating to 1948, manufactured by the Hagana (Glick below; Fig. 10:1). Rooms 2, 4, 5, 6 and 7 were all square (4 × 4 m; Fig. 5), and their floors were not preserved. A rectangular installation (L259; Fig. 6) was found in the northern corner of Room 4, preserved to a height of one course. An accumulation of brown soil inside it contained fragments of pottery dating to the late Ottoman period. A British rifle-cartridge dating to 1918 (see Glick below; Fig. 9:3) was also found. Another cartridge, German and dating to 1917 (see Glick below; Fig. 9:4), was discovered outside Room 2. The function of the installation is unclear and it may have been used to store dry produce such as wheat. In Room 6, a row of stones was set against the southwestern wall (W215; Fig. 7), possibly a shelf for tools, but more likely a bench. 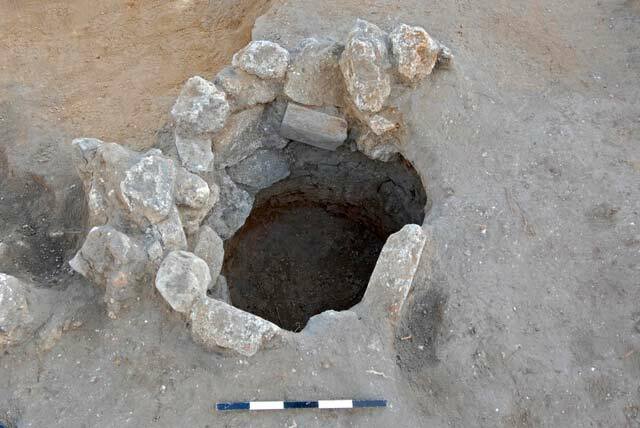 Two cesspits were discovered just outside Building 1: cess pit L240 was dug in sandy soil northwest of Room 1; cesspit L109, was also dug in sandy soil, south of Room 1, and had dry-construction lining of small and medium kurkar stones (Fig. 8). 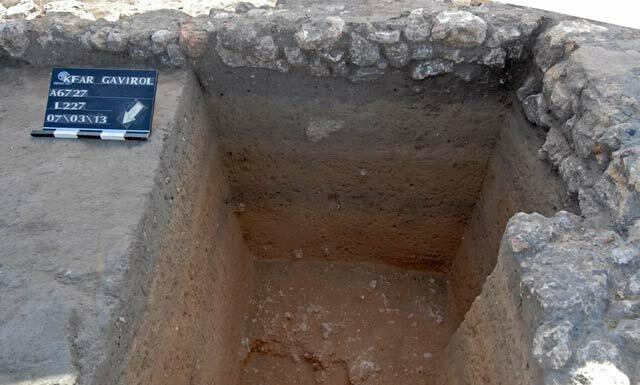 Brown soil accumulated inside the pits, mixed with organic material and a scant quantity of pottery sherds dating to the late Ottoman and the British Mandate periods. A British rifle cartridge from 1917 (Glick below: Fig. 9:2) was found above cesspit L109. Two pits (L132 and L251, average diam. c. 1 m; Fig. 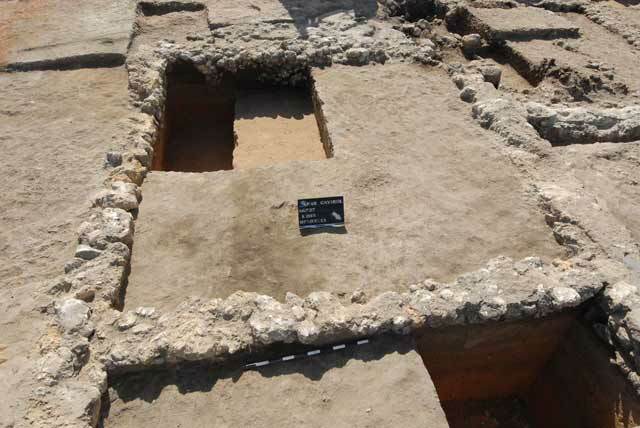 2) were dug into the sandy layer below the level of the building's floors and foundations. A probe revealed an accumulation of black soil mixed with fragments of pottery, dating to the late Ottoman and the British Mandate periods. The purpose of the pits was unclear. A very long wall (W265; exposed length c. 15 m) was discovered northeast of the building; it extended in a northeast–southwest direction and was built of small, medium and large, roughly hewn, kurkar stones. The wall was preserved to a height of one–two courses. It seems to have been part of the building, although no points of contact were found between the two. The wall was apparently later than the building, and given its length, may be a fence. A segment of a white plaster floor (L220) over a bedding of whole and crushed shells was discovered c. 5 m southeast of W265. A coin dating to the reign of the Ottoman sultan Mehmed III (below) was discovered in a probe (L241) southeast of the floor. The floor segment and the long wall W265 suggest that the area was a courtyard. Paved areas outside the buildings were also identified west (L134) and south (L125) of Building 1. The segments of pavement are indicative of activity areas outside the building, or of additional rooms. An American rifle cartridge from 1975 was found above Floor 134 (see Glick below; Fig. 10:4). Building(?) No. 2. This structure, which was located in the northern part of the excavation area, was damaged by modern activity and was very poorly preserved. A wall (W219) built on an east–west axis was discovered. A segment of another wall (W248), which was robbed, or damaged by modern activity, was discovered southeast of W219. The remains of two other walls that did not survived were discerned north of W219, indicating that the structure extended farther to the north. The function of the building and its relation to Building 1 are not clear. 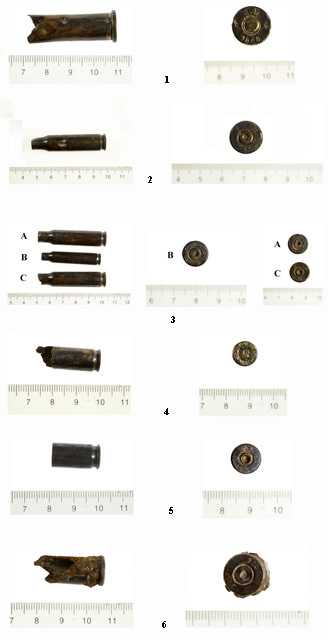 A rifle cartridge which could not be identified with certainty was found in the accumulations above W219 (see Glick below; Fig. 10:6). Building/Room(?) No. 3. This structure, which was located in the eastern part of the area, was not entirely exposed, because it extended beyond the limits of the excavation. The room (bounded by W252 in the west, W260 in the south, W261 in the east) was oriented northeast–southwest. The eastern wall (W261) was partially uncovered. The continuation of W252 to the south is indicative of another space. These remains may also be related to Building 1. The excavation yielded a small, hand-collected assemblage of animal bones. The assemblage was washed with tap water to remove adhering soil and facilitate identification. The analysis of the assemblage took into account all the bone-fragments that could be identified, including body fragments of long bones (diaphyses), ribs, and vertebrae, using as reference the comparative collection of the archaeozoological laboratory of the University of Haifa. One hundred and three bones were identified in the assemblage: part of them (N=50) to the level of taxon, and part (N=53) to body-size group (size of cattle or size of sheep/goats). Most of the bones that were identified to taxon belonged to sheep/goats (N=26; 52%). Cattle (N=15, 30%) are the second most common species in the assemblage followed by Equidae (N=7, 14%). Three Equidae bones were identified according to their morphology as donkey. Two camel bones—an astragal bearing cut-marks and a phalanx—suggest consumption of camel meat. Most of the sheep/goat bones for which it was possible to determine the level of fusion (N=5) were unfused (N=4), suggesting consumption of young animals, in contrast with the assemblages from the late Ottoman and British Mandate period dwellings at Kefar Gevirol (Jakoel 2012; Jakoel in print), where both young and mature individuals were identified. Six bones and three teeth, for which signs of age were identifiable, were of mature cattle, presumably work animals that were eventually slaughtered and consumed. Insofar as the Equidae are concerned, one metacarpal bone was unfused, and of four molars, one was deciduous. The few Equidae bones that were found, bore no butchering marks and were probably not related to meat consumption. For the purpose of calculating distribution of skeletal parts, the sheep/goat and cattle bones were combined with the bones that were identified as medium and large animals respectively. The calculation was according to a simple count of the bones (NISP), because the small sample size made it impossible to get significant results using the various methods of Minimum Number calculation (for example MNE). The distribution of skeletal parts was similar in sheep/goat and cattle. Outstanding aspects of the distribution were the large number of axial skeletal parts (ribs and vertebrae) and upper limbs (scapula, humerus, radius, femur and tibia), and the paucity of head and lower limbs bones (fore and rear feet and phalanx). This pattern implies that the dismemberment sequence, which includes the removal of the feet and head, was not done where the food were discarded. Butchering involved the use of heavy chopping tools such as a cleaver. No longitudinal cut-marks, which are characteristic of carcasses that are hung for dismemberment, were visible on the vertebrae of the sheep/goats, possibly because of the small sample-size. The absence of burnt bones suggests that the meat was cooked rather than roasted. Most of the bones are fractured, with a smooth spiral crack (N=18, 72%) indicating that they were split while fresh, apparently in order to extract the bone marrow to eat or to thicken a cooked dish; the only example of cracking, which offers direct evidence to the practice, is a cleaver strike in the center of ametacarpal of a large animal. The assemblage is well-preserved; very few bones were gnawed by predators (N=4, 4%), and most of them (N=25, 81%) were not weathered as a result of having remained on the surface for a long period prior to burial. In conclusion, the assemblage is well-preserved and represents mainly the consumption of young sheep/goats and mature cattle. Butchering was done with tools appropriate for the age of the animals: knives and cleavers for the mature animals, knives for the young ones. The bones were split in order to extract the marrow and the meat was cooked. Assuming that the difference in the age of animals at the time of death, which was observed between the assemblage of the current excavation and that of the dwellings (Jakoel 2012; Jakoel in print), is not due to a bias resulting from sample-size, we can conclude that the occupants of the large building consumed the meat of young sheep/goats, whereas those of the dwellings consumed both young and mature sheep/goats. It can be argued that the ability to choose the quality-meat of young animals in the large building reflects the relative affluence of its residents in comparison with the tenants of the dwellings. The latter ate the product of natural mortality in the herd: animals that died young and those that were slaughtered as adults because of illness, injury or declining fertility. The consumption of these animals reflects availability rather than the culinary preference, which was reserved for the affluent. Thirteen cartridges of small-arms bullets were found in the excavation. The collection includes items from three periods: the First World War, the War of Independence and the late 1960s–early 1970s. The First World War (Fig. 9). Three cartridges manufactured in Britain and two in Germany were found. Cartridge No. 1, which was found on the surface, was fired; it is a British .303 (7.7 × 56mmR) cartridge, which was manufactured in 1915 by Greenwood and Batley in Leeds, England. Cartridge No. 2 is a British .303 (7.7 × 56mmR) cartridge, probably fired, without a bullet; it is a Type Mk VII, manufactured in 1917 by Birmingham Metal and Munitions Co. Ltd of Birmingham, England. Cartridge No. 3 is a .303 British (7.7 × 56mmR) cartridge, fired and without a bullet; it is a Type MK VII, manufactured in 1918 by Kynoch & Co. of Witton, Birmingham in England. In addition to the British cartridges, two German-made cartridges were discovered, unfired and without a bullet, both are of a Mauser 7.92 × 57 mm, manufactured by Königliches Munitionsfabrik of Spandau, Germany. Cartridge No. 4 was manufactured in May 1917, cartridge No. 5 in the month of March, year unknown, but probably also during the First World War. Both cartridges are from Series S67 (a pointed bullet, 67% copper). The War of Independence (Fig. 1:10). One cartridge was found: a British .303 (7.7 × 56mmR) cartridge from 1948, not fired and without a bullet; it was manufactured in the Hagana factories, and bears the marking מ י (Medinah Yehudit = Jewish State). The quality of the cartridge was inferior because of the poor conditions in which the ammunition was manufactured, and a shortage of equipment is evident. A seam can clearly be identified between the metal head of the cartridge and its body. The head was coarsely worked, possibly even by hand. A. Three cartridges of NATO 7.62 × 51mm type, used by the NATO countries in the 1950s; all are fired and without bullets (Figs. 10:2, 10:3A, 10:3C). All three were manufactured by the Israel Military Industries and are dated November 1968, July 1969 and February 1972. B. Two cartridges of NATO 5.56 × 45mm type; fired and without bullets. This was the principal ammunition of modern western assault rifles (Figs. 10:3B, 10:4). The cartridges were manufactured in 1975 by the Western Cartridge Company of East Alton, Illinois. C. A Parabellum 9 × 19mm (Fig. 10:5) cartridge; fired and without a bullet. This type of ammunition was mainly used in pistols and sub-machine guns such as the Uzi. It was manufactured by the Israel Military Industries in December 1969. Another fired cartridge was found (Fig. 10:6), which was too poorly preserved to be identified or accurately dated. Evidently it was jammed in the barrel, and was extract with a tool that caused damage to the rear of the cartridge so that it was impossible to determine with certainty if it had a raised rim. It is probably a British cartridge, possibly manufactured by the Lorenz Ammunition and Ordnance Company, or by the Ludlow and Company. In conclusion, the live ammunition which had been collected from First World War battlefields was used for many years afterwards, and was also widely used in the War of Independence, since it fitted the Lee-Enfield and Mauser rifles, and the BREN, VICKERS, BESA and MG machine-guns that were the principal weapons of both sides in that conflict. For these reasons, it is possible to identify the date of manufacture of this type of ammunition, but not the date of its use. The distinction should be based on the stratigraphy of the site, but in this excavation the nature of the site did not permit it. The British cartridges stand out in having different series of manufacture. An examination of ammunition from other battlefields shows that during the First World War British units were regularly supplied, and usually used, ammunition from a single source. 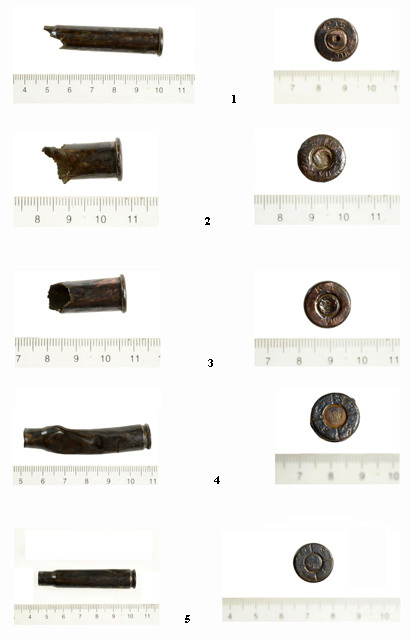 Thus, the different sources for the cartridges in the current excavation may be an indication that ammunition was collected from various First World War battlefields. It is not possible to determine if the ammunition was collected while it was still live—for future use—or if it had already been fired. Nor was it possible to determine if the cartridges from the First World War and the War of Independence are from two separate battles (in 1918 and in 1948–1949) or from one battle that took place during the War of Independence. The ammunition from the 1960s–1970s clearly belonged to IDF units. The cartridges, which are of American origin, were probably supplied during the munitions replenishment following the Yom Kippur War. The presence of modern ammunition alongside ammunition from the First World War may indicate a single collection that included items from all wars. This suggestion remains tentative, because the finds were discovered on the surface and may be a mixture from different strata. The remains of the buildings and pits which were discovered in the excavation date to the late Ottoman period. Given the ceramic finds (see Appendix 1), the glass finds (see Appendix 2) and the coins, the buildings remained in use during the British Mandate and later. The remains are of the Arab village of el- Qubibah. Remains of the village were also discovered in previous excavations. 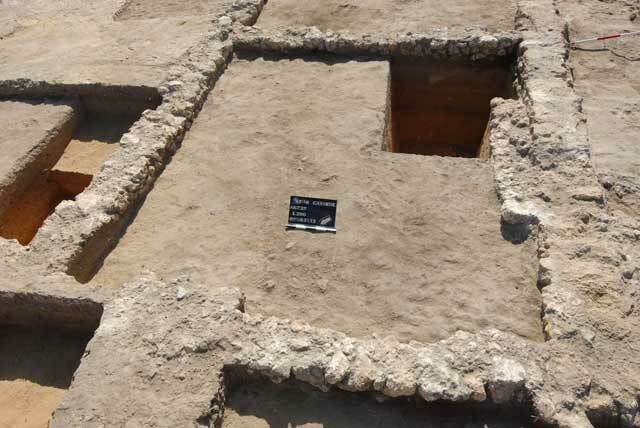 Comparison of the archaeological remains from the current and previous excavations raises interesting issues, which may clarify the function of the main building which was excavated, and provide information about the population that resided in it. In the previous excavations the domestic nature of the finds was obvious (the multitude of tabuns, household wares, etc); the architecture pointed to small, densely built houses; the ceramic, glass and animal bones reflected the daily life of a population in the socio-economic status typical of the villages of the period (Jakoel in print). The remains of the buildings in the current excavation differ from the ones previously excavated in their architecture, in the pottery finds and in the faunal remains. The size of the houses in the previous excavations was on average c. 10 × 10 m, while the dimensions of the main structure in the current excavation were c. 15 × 15 m, about 50% larger. In addition, no tabun was found in the main building which was exposed in the current excavation, nor were there any nearby. The quantity of pottery that was found is small when compared with the assemblages from the residential buildings that were uncovered in previous excavations. Significant differences between the assemblies are also apparent in the animal bones. The assemblages from previous excavations show consumption of the herd’s natural mortality, whereas quality-meat of young animals was consumed by the occupants of the large residence. These data raise two possibilities for the function of the building. Either it was used for public purposes, which would explain the paucity of finds and the absence of tabuns; or the building was a dwelling of an affluent population. 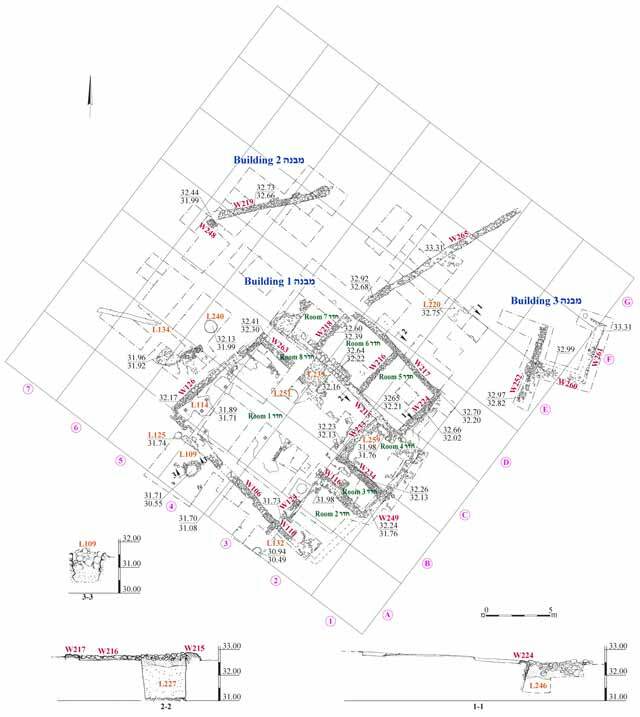 The PEF maps show that the excavation area was in the heart of the village, supporting the assumption that the building was of considerable importance, regardless of whether it belonged to a wealthy family, or was used as a public structure. Like the buildings which were discovered in the previous excavations, this structure went out of use in the mid-twentieth century and the area was razed and leveled. The building remains that were discovered contribute to our understanding of the layout of el-Qubibah in the late Ottoman period and later. Although meager, the pottery finds from the Byzantine-period which was collected below the level of the buildings, indicate activity in the area at the time. Arbel Y. Greenvald T. and Ben-Ari C. 2013. Tell Musa Shahin (Kefar Gevirol). HA-ESI 125. Fischer M. and Taxel I. 2006. Yavne, Survey Map. HA-ESI-118. Jakoel E. 2012. Tell Musa Shahin (Kefar Gevirol). HA-ESI 124. Jakoel E. in-press. Qubibah in the Late Ottoman Period: An Archeological Outlook. ‘Atiqot. 3. Wall 216, looking southeast. 4. Room 1, looking east. 5. Room 5, looking southwest. 6. Installation 259, looking northwest. 7. Room 6, looking southeast. 8. Cesspit 109, looking north. 9. Rifle cartridges from the First World War. 10. Rifle cartridges from the War of Independence and afterwards.